If I lived on a desert island and only had a choice of seven dishes to choose from, these Chive Potato Latkes would be one of them. I will never forget the first time I ever tried a Latke - I was 7 years old. I was in Grade 1, my teacher brought in a portable gas stove, a pan and a bag full of ingredients to make this dish. As she fried each pancake, I vividly remember the aroma and sound of each one frying in oil. The amazing smell filled the classroom and I was enchanted by it. The best part was sinking my teeth into the crispy fritter only to find the warmth of the soft inside. It was in that moment I fell in love with the taste of potatoes. These Chive Potato Latkes are made with organic Russet Potatoes. It is important to use Russet Potatoes for this recipe due to the higher starch content, which yields even crispier pancakes! I am cooking with potatoes by EarthFresh. They were kind enough to send me a bag of their russet potatoes and an assortment of baby potatoes. EarthFresh potatoes are grown without the use of pesticides or chemicals. 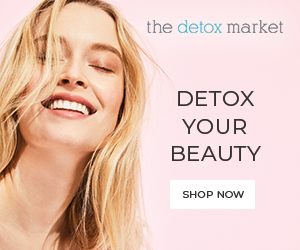 They work with some of the best organic farmers in North America to "grow their crops using natural systems, and to package them in safe certified packing plants. We ensure that we maintain fertile, living soils while protecting the intricate balance of earth, water, and air". It is no wonder their potatoes are incredibly fresh and firm, compared to other brands I have tried. 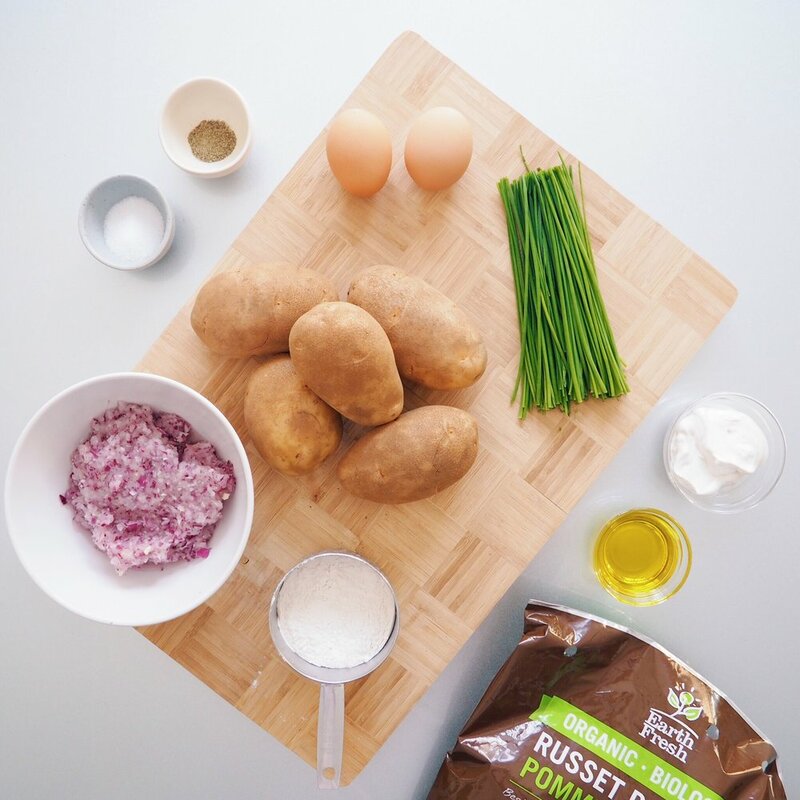 You can purchase their potatoes at Sobeys, Metro, Fortinos, Farm Boy, and Wholefoods in Ontario, Canada. For this recipe, I decided to throw in my own twist to this classic dish by using red onion and fresh chives. The typical Potato Latke does not contain chives nor do they use red onions. So by using these two ingredients, they add great taste and aroma without being overpowering. I've also accompanied this dish with dairy-free sour cream. Well I hope you give this recipe a shot and enjoy it! If you do, please share it with your family and friends. Disclaimer: I am not sponsored by any of the brands listed in this post. EarthFresh kindly sent me a box of their potatoes to try and because they were so fresh and delicious, I have used them in this recipe. These products are mentioned because I believe in their quality as well as the company behind them. Prepare your ingredients as listed above. 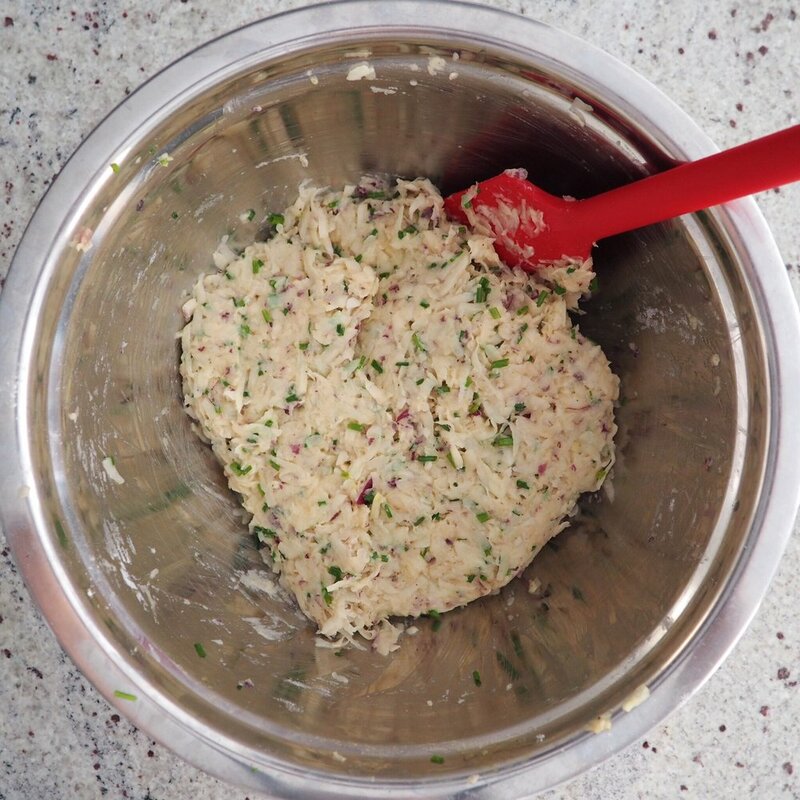 In a food processor, blend your red onion until minced. Transfer the shredded onions into a colander to strain excess water. Peel potatoes. Using a box shredder, shred them using the larger setting. Place the shredded potatoes into the same colander to strain excess water. Transfer the shredded potatoes and onions into a cheesecloth. Gather the corners of the cheesecloth and twist together. Keep twisting until you squeeze out the excess water. Squeeze until no water is left. 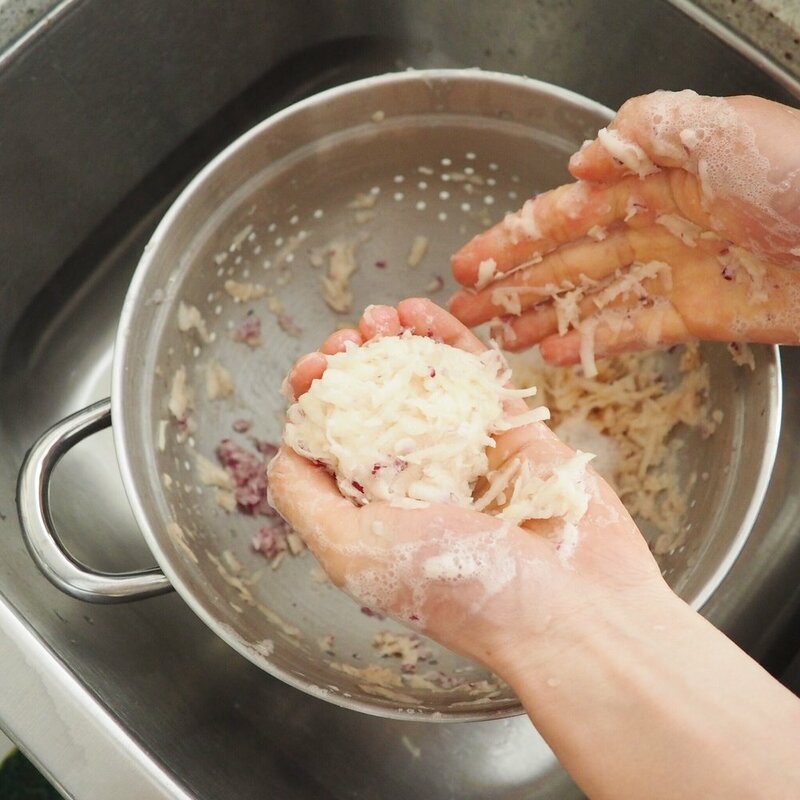 Alternative: If you do not have a cheesecloth, with clean hands form a ball with the mixture and squeeze out the excess water until there is no water left to squeeze. 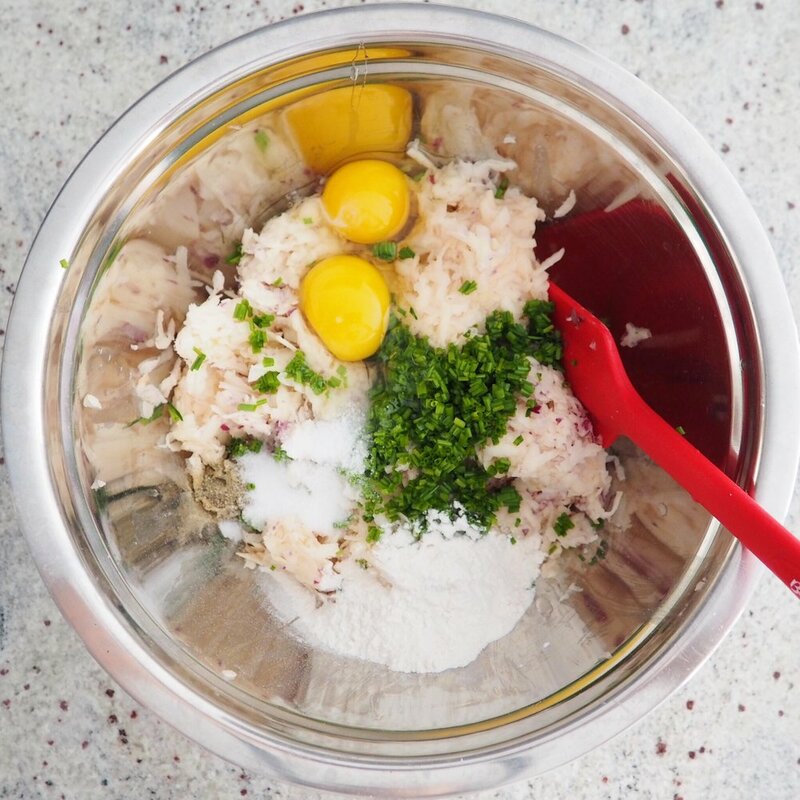 In a large mixing bowl, add in the potatoes, red onions, chopped chives, eggs, flour, salt, and pepper. Mix until well combined. In a large frying pan set on medium high heat, add in your extra virgin olive oil. Once pan is hot, scoop 1.5 tbsps. of pancake mixture into pan and flatten it out with spatula. Fry on each side until golden brown, about 5-7 minutes. Drain the latkes on a plate lined with paper towel. Serve with dairy-free sour cream and garnish with any leftover chives. Enjoy! Step 1: Prepare your ingredients as listed above in INGREDIENTS SECTION. Mince your red onions for ease using a food processor for ease. Step 2: Peel and shred potatoes with box shredder using larger setting. Transfer shredded potatoes and onions into a colander to strain of excess water content. Step 3: Take a handful of the shredded potatoes and minced red onions forming a ball. Squeeze out excess water until most of the water is gone. Alternative: transfer shredded mixture into a cheesecloth. Gather the corners of the cheesecloth and twist together. Keep twisting until you squeeze out the excess water. Squeeze until no water is left. Step 4: In a large mixing bowl, mix all your ingredients except for the olive oil. Step 5: In a large pan set on medium to high heat, add in olive oil and scoop 1.5 tbsp. of pancake mixture into hot pan. Flatten out with spatula and fry until golden brown on each side, about 5-7 minutes. Serve and enjoy!